Dimensions 0.75 by 7 by 9 in. Amazon.com description: Product Description: Ellen Lupton, with essays by Jennifer Tobias, Alicia Imperiale, Grace Jeffers, Available now in a paperback edition, Skin: Surface, Substance, and Design contains a new preface by Ellen Lupton, describing products and projects that have been produced since the book's initial publication. Skin presents products, furniture, fashion, architecture, and media that expand the limits of what we understand as surface. Reflecting the convergence of natural and artificial life, this provocative and stimulating book shows how enhanced and simulated skins appear everywhere in our contemporary world. 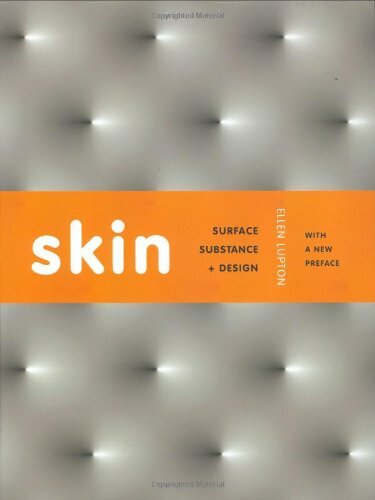 About: Ellen Lupton, with essays by Jennifer Tobias, Alicia Imperiale, Grace Jeffers, Available now in a paperback edition, Skin: Surface, Substance, and Design contains a new preface by Ellen Lupton, describing products and projects that have been produced since the book's initial publication.